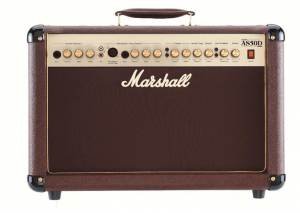 Can You Use The Same Amplifier For Acoustic And Electric Guitars? Tube vs Solid State Amps? Acoustic guitars sound great on their own. However, when you move past the living room, you will want to amplify your sound. We’ve already discussed pickups, and now I’m going to review external amplifiers for you. Whether you need a small portable combo amp for playing small local gigs or a larger sound system for leading your worship service with a band, I review them all. I’ve prioritized amps that will preserve your guitar’s sound quality when at high volume. I also have looked for “fail points” in their design that might make an amp less rugged. Every one of the systems on this page is going to be an excellent gigging amp. Go Here for Amazons Amplifiers for your acoustic guitar. At first glance, this amplifier doesn’t look like much. For a long time we guitarists have sub-consciously chosen our amps, in part, based on how large they are. With its single, 8-inch speaker and 17-inch overall height, it is easy to underestimate this amplifier. What it lacks in size, it makes up for in engineering. Designed for the singer-songwriter who wants to run both their guitar and their instrument through a single combo amp without sacrificing an ounce of sound quality. This amp has the stamp (and design input) of Tommy Emmanuel, and from the first time you plug your guitar in, you notice that it is a better unit than any other amp you’ve worked with. It is designed to deliver clear, fingerstyle tones, and that engineering flows into all aspects of the sound quality. One channel is instrument only and the other channel can either be used for an instrument or for a mic input. With 60 watts, you have enough volume for small and medium size facilities. However, when you need to use the line out to plug it into a bigger sound system, you’ll still have the incredible electronics to use this unit as a head and unit and monitor. It’s going to be out of the price range of most of my readers, but the sound quality is absolutely addictive. If you can afford this amp, it is the way to go. If you are looking to spend close to $1,000 on an amplification system, then you are obviously serious about your sound. The challenge is that between the $700 mark and the $1200 mark there is somewhat a lack of good amplifiers as manufacturers shift their focus from the hobby player to the professional setup. 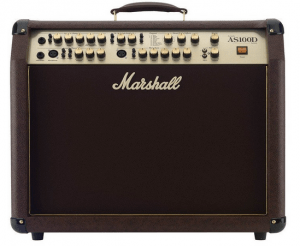 The Marshall AS100D is one of the nicest guitar amps you will find around this price range. The “big brother” to the well-known smaller AS50D, the AS100D offers dual speakers with a dual channel setup so you can run both vocals and guitars, two guitars, or one guitar on two separate voices, and switch between them with a pedal. The 4-channel controls are really neat for those gigs you have in mind. Channels 1 and 2 have separate 3-band eq so that you can dial them in separately, (or link them together). You can mic in vocals or run a backing track through it. It also has an output for plugging into a PA system. 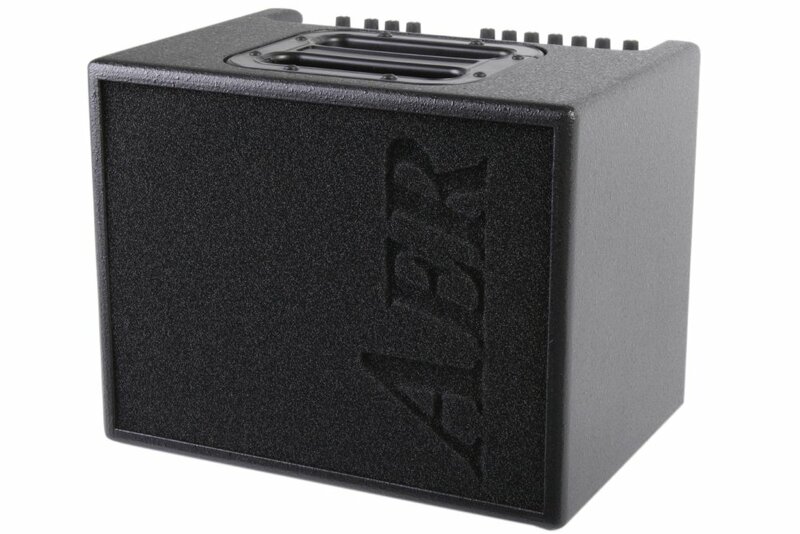 If find yourself on a bigger stage, you can easily use this amp as your monitor, and run the feed up to the PA system. The four inputs are a major selling point of this unit. You get two Instrument inputs and two XLR Inputs. The same goes for output in that you get two stereo outputs in 2 1/4-inch jacks and 2 XLR outputs. It does not have a stereo input. The anti-feedback system is extremely robust with both phase control and notch filters, so you can keep your sound steady and feedback free, especially nice for those songs where you have to go from soft picking to all-out strumming in the same song. This unit falls a little short on the reverb and effects. It also doesn’t offer playback, recording or any other gimmicks. On the upside, if you ever really decided those things were important to you, you would eventually want to add those via pedals, anyhow. It saves you money on the foo-foo stuff, and so you can invest where if matters: on quality sound. And sound is what the AS100D delivers. Full-ranged, full-bodied, this amp was designed for one thing: the acoustic guitar. You can finally get that crisp, full, clear, accurate sound that accurately reflects your playing. If you have a little extra money and are looking for a way to set your playing apart from the pack, this would be the way to go. 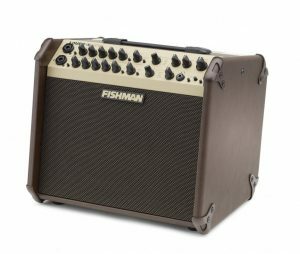 We cover the Fishman-branded equipment quite frequently on this blog. They make some of the most popular pickups, and consistently deliver some of the best-sounding electronics. It accepts both 1/4″ and XLR inputs and offers balanced XLR outputs. The 3-band Equalizer is very responsive and gives you a surprising amount of control. The 8 inch speaker delivers excellent sound, but It doesn’t — in my opinion — offer the same amount of clarity as the Marshall AS100D. This is a great device for the artist who is constantly playing to large crowds and worried that they are lacking in power. This amp delivers power and volume. But I do feel like it loses some finesse. I really don’t understand why it is that you will see the Marshall trash-talked so much in the forums. It seems to be the brand that everyone loves to hate. And maybe that is because it doesn’t offer all of the flashy “bells and whistles” that a lot of the newer guitar amps offer. Or maybe it’s because the metal-heads “ruined” their image for them. Whatever the reason, all you have to do is plug your guitar into one of these Marshall systems and see that they are a serious steal for the money, and it’s time that the forums quit yakking and started listening. The AS50D offers a lot for the small package that it is. The 2, 8-inch speakers are well-balanced to allow for a full range of sound, and the additional combo XLR and RCA inputs let you also play your MP3’s through this box or plug in an additional instrument. It also offers phantom power for those microphones that need require it to work. For effects, it offers everything you need — and not a drop more. You have the digital chorus and reverb, standard on most amps in this price range. The reverb is a little underwhelming, so if you are serious about that effect, you might want to add it externally. The feedback control is top-notch, however, with an anti-feedback notch filter to let you dial in your sound without feedback. As with the AS100D, this model specializes on amplifying the true sound of the instrument. It doesn’t matter what pickup you are using, this option is set to deliver clear, acoustic tones. For the aspiring career musician who wants to expand their playing to local gigs, this is a perfect setup. you have enough sound to fill up a small bar or coffee shop without requiring you to pawn your favorite pet. The Roland AC-60 is an extremely compact amp. Buy using two, 6 and 1/2 inch speakers, they are able to provide a smaller case, making this an ideal choice for the musician who is always on the go. It comes with some basic effects including a chorus, reverb and delay. For acoustic playing, that should be more than enough. The best part is that you can control these with a foot pedal (purchase separately), which allows you to switch effects mid-song. There is also a pickup and shape switch on the guitar input that allows you to control the guitar tone. The Microphone input provides phantom power. I like that the chorus knob allows you some control to dial the mix up or down. That is a lot more than you would expect on an amp like this. Some of the more expensive amplifiers don’t evne offer that. The anti-feedback controls makes this amplifier an excellent option for playing with others in scenarios where you don’t have much control over the environment. The line out comes in handy since this amp only has 30 watts of stereo sound. If you are playing a larger venue, you can use the line out to send it to a mixing board and PA system. The sound quality on the AC-60 is surprisingly deep for such a small combo. It makes a perfect monitor for large venues and sounds good for small gigs. I realize that this amplifier may be a little bit out of the range you guys are shopping for, but it is such an incredible value, I want to offer it as a selection for you to consider. The downside about most of the amplifiers is that they really start to loose a lot of quality at this price point. For electric guitars, that does not matter quite as much. But for acoustics, it really changes your entire tone and presentation and it is a major factor. 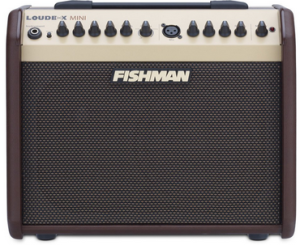 The Fishman Loudbox does a good job maintaining most of the acoustic sound and delivering that in true form. While I’m not trying to pass this off as an audiophile’s dream, this is a unit that is going to impress and not break the bank. I also love the fact that this is not a small amp. With 60 watts of power, a 6.5″ woofer and a 1″ tweeter, you get enough “oomph” to be able to use this as a gigging machine. Having so much power in a small package does bring the challenge that you may need to practice some with the phase modulator and get the sound sorted out so that you aren’t fighting feedback — especially if you have a “hot” pickup. The dual channels is great for plugging both your guitar and your vocals into. With a built-in equalizer and digital reverb and chorus, you have some basic effects. But that’s it. No Frills. The Loudbox Mini is all about delivering a lot of quality sound, and the reviews back it up. In my opinion, this is the best guitar on this list for the money. Having good bass amplification is all about moving lots of air in a very delicate manner. Depending on the size of the venue you usually play at, you might need to invest in a decent stack in order to cut through the mix properly. At this point, most bass players are imagining expensive Ampeg cabs. However, it can be done a lot cheaper with losing much of the sound quality. One such pretty affordable bass cabinet is the topic of this article. Stagg BC410 isn’t all that popular, but it definitely offers the core performance you need for a decent bass sound on a larger scale. The overall design of the cabinet is pretty simple. There’s no crazy shapes, details or anything else that would increase the production cost without also increasing the performance. The finish is matte black, and the only things that stand out are the Stagg logo on the bottom of the speaker mesh and a little graphic piece on the top. There are two pull-out handles on each side for easier transportation, and that is about as far as it gets when it comes to appearance and exterior design of this cab. Now for the important stuff. This thing runs a 4×10 inch, 16 Ohm speaker setup that can handle 300 Watts of power. That might not seem like much until you take a look at the price tag. Stagg BC410 is a bargain. Performance is where this cabinet really starts to shine. One of the ways most people tend to describe Stagg as a company is to say that they produce equipment and instruments that get the job done. While this is absolutely true when it comes to BC410, it does a bit more than just that. The sound is very balanced, with clean trebles, solid mids, and very rich lows. You get the kind of definition that would otherwise cost a lot more. Hook this thing up to a decent amp, and you will find that it keeps up the pace without a problem. Comparing it to other bass cabs made by more reputable manufacturers will yield expected results. It falls behind in some aspects, but the price difference makes up for that. 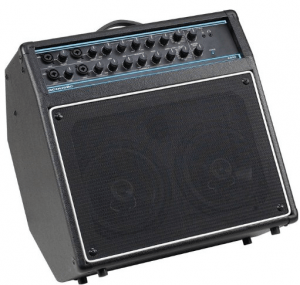 You can comfortably use this cab for gigging and manage to cut through the band with enough power, even in the low end of the frequency range. It has enough power to be used in medium sized venues while it absolutely overpowers a smaller room. Figuring out what kind of bass stack setup best suits you is one of those things you can spend countless hours doing. What Stagg BC410 offers is a great bang for the buck performance. It’s a simple cab that gets the job done consistently and reliably. These cabs have performed extremely well so far. Even though they don’t get much exposure, it is definitely worth checking out especially if you are on a tight budget. A single BC410 paired with a decent amp is a true performer. 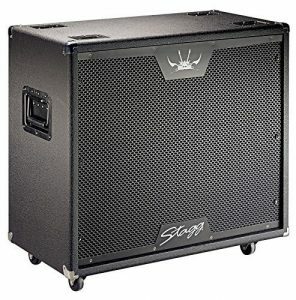 If you are only into electric guitars, hearing that Stagg makes amps might be news for you. However, the acoustic crowd is somewhat familiar with this. They offer decent amps at very competitive prices, which is exactly what most of the market is looking for. At the end of the day, these amps are more simple to design and make. The one we are going to take a look at today is probably one of Stagg’s better models in the mid-range. It comes with a very attractive performance to price ratio that makes it interesting to performing artists who are doing smaller venues on a weekly basis. What we have here is a 20 Watt unit that delivers the sound through a single 6.5-inch speaker at the front. The design is somewhat vintage with that brown speaker mesh and a similar looking cabinet. Inputs available are a single 1/4 inch jack for your instrument and a single XLR for a microphone. Each of the inputs has its own volume knobs. At the very end of the control cluster, you will also find a 1/4-inch input for your MP3 device and a Headphones Out. This amp comes with a standard three-band EQ with one addition. Aside from regular mid control, you also have parametric mid control. These also features a spring reverb. For a little and affordable option such as this, the sound you get is surprising, to say the least. Sure, it’s not on the level of some heavy hitters on the market, but it definitely punches above its price range quite a bit. When you are dealing with cheaper acoustic guitar amps, often times you get that tone which just doesn’t sound natural. That is not the case with this Stagg. It amplifies the signal from your guitar and delivers a sound that feels 100% acoustic. This doesn’t change even if you go to the extremes with the EQ. The level of sonic clarity is impressive and you will definitely hear all the subtle elements of your performance. The reverb that comes with the amp is great. Compared to spring reverbs found on more expensive amps, this one is a bit stiff but still very much usable. In terms of applications, this little guy will have you covered for practice sessions and small gigs. If you ever feel that it lacks power, putting a mic in front of it will solve that issue. Even though it lacks some of the features found on the Fishman Loudbox Mini, you could say that Stagg 20 AA R USA can easily compete with amplifiers that cost approximately twice as much. 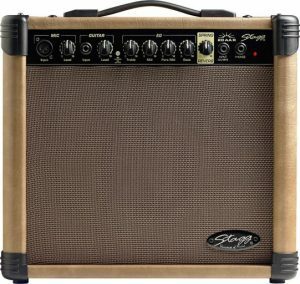 When it comes to affordable acoustic electric guitar amps in this price range, Stagg 20 AA R USA is about as good as it gets to be completely honest. It’s a simple amp that delivers a constant, but quality performance. This is the obvious bang for the buck option at this moment. If you think the $200 price range is full of crappy-sounding amplifiers, you’ve got to check out the $100 price range. 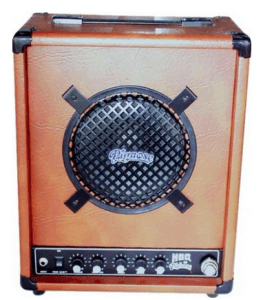 There are so many “fake” amps that are actually made by knock-off companies in China and then re-marketed in the US as being something awesome. Be careful, there is a lot of crap out there! However, Fender — while still having a lot of parts made in other countries — is a brand that takes care to protect their image. And the Acoustasonic is one of their top models. 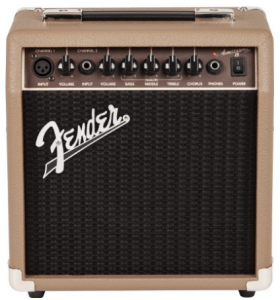 We haven’t included any on this list because there are so many other excellent amps to choose from that I feel are a better value, but Fender does offer an Acoustasonic at virtually every price point. And it doesn’t get much more simplistic than this. You get 6″ woofer and then 1″ tweeter cone to help you reach your entire range. It has a jack for your instrument and a jack for your microphone — although I wouldn’t expect to get incredible sound out of this system if you are planning on running both a guitar and vocals at the same time. Where the Acoustasonic really shines is amplifying acoustic and hollow-body acoustic-electric guitars. This is what it is designed to do and it delivers a clear sound that is pleasing and representative of what you are playing. Granted, this little amp is not going to blow you away, but it is truly a high-end practice amp that won’t waste all of your time trying to get it dialed in before you play. If you need a guitar amp for home use or something easy to move to your friend’s house for a night of strumming, this little fella’ is an excellent choice for a reasonable price. Click The Link Below To Check Amazon And See It’s Current Price. Shred on the go! Finally a rechargeable amp with usable battery life! 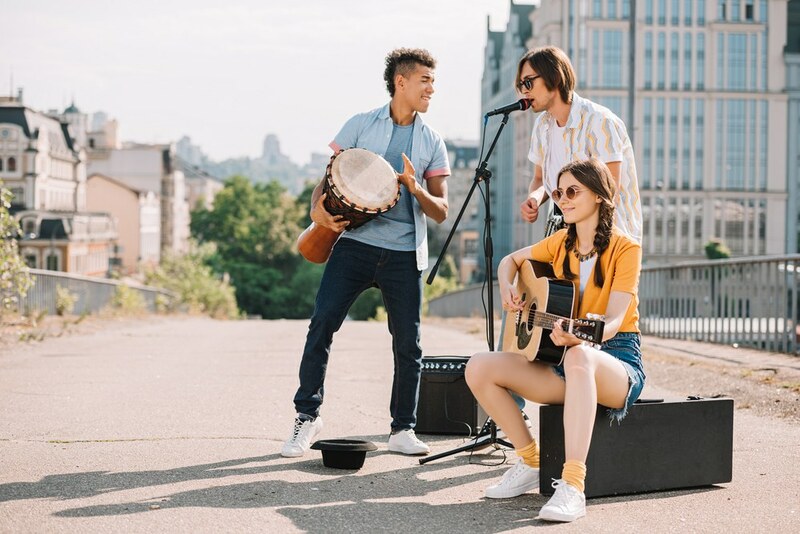 The HOG 30 amp really works best for small acoustic settings such as jam sessions around a campfire, strolling through tables at a party or wedding reception, busking or just practice sessions. It also works decently in noncrowded indoor settings, though if the crowd noise gets high it can get lost in the bustle making it not always ideal for a larger gig. The owner’s manual claims up to 35 watts of power, though 20-30 watts seems to be a more realistic output. This tough little compact 8-inch speaker weighs only 25lbs making it extremely portable, easy to mount on a cart if you’re moving around much and it is battery operated so there are no cords to hassle with. The included AC adapter allows you to plug the unit in and run it on AC power if you want, but the manual recommends only using the adapter for recharging the battery life when not in use. The battery has excellent battery life (it runs for hours on one battery charge, using less power will, of course, keep it running longer), though each charging session will require a good 8-10 hours to complete. It even comes with rechargeable batteries so you don’t have to make an extra purchase on the side to get your hands on batteries before being able to use it. Though, designed primarily for electric guitars and other electric instruments such as keyboards this amp also works very well for plugging in mics and amplifying devices such as cd players, radios, etc and multiple units can be strung together to achieve an even higher quality sound. The sound is good, especially considering that it is battery powered. And the battery life (and the fact that it is rechargeable) is amazing. All in all, this feels like a great product for the price. As you probably know by now, that when you buy something to do double-duty, you are going to have to compromise somewhere. (That, or pay a lot of extra money). You can have high-quality sound, or you can have the resilience for an electric guitar or you can get an affordable amp, but you can’t get all three. However, at Trusty Guitar, I like to think I can help my visitors find the best value for their money, and I know a lot of you plan on doing double-duty and need to stretch the dollars. Plus, if you can use the same amp for both, it makes it much easier to do gigs with. Ideally, for an electric guitar, you are going to choose an amplifier that doesn’t have a tweeter. Tweeters are important to have for acoustic guitars if you are trying to capture the full range of sound — for an electric guitar, however, they can be absolutely ear-splitting. Ok, so you have already looked at the Acoustic AG30 that I reviewed above. For this amplifier, I am going to try to get you to spend just a little bit more money and go with the AG60. The AG30 is actually really good for both vocal and acoustic guitar at the same time. It has incredible range and the quality of workmanship makes it supremely adaptable to this role. However, it only has one equalizer band for both channels. And, let’s face it, guitars and voices need entirely different equalization. What I love about the AG60 is that it offers separate equalization for each channel. That way you can dial in your sound for the guitar, and then also dial in the sound for the vocals or keyboard or whatever else you are running through it. The other cool thing is the higher wattage. Since you are obviously planning on doing some gigs, having a 60-watt rig means that you are able to handle everything from your coffee shop to the school or church auditorium without breaking a sweat. The dual speakers not only help project that power in a balanced fashion but also add to the tonal quality when running more than one source through it. Finally, the reverb and effects are applicable to the voice just as well as the guitar. This can give you tons more control over tonal quality and helps singer-songwriters to always sound their best. If there was a downside to this system, its that it doesn’t handle the full 60 watts very well. You get a lot more out of it than you do the 30 watts, but you still can’t take it all the way up to full volume without getting some distortion. That said, for the price, I feel that this is probably the best solution for those who plan on doing equal amounts of vocals and guitar through the same amp. A lot of people plan on using the same amp for both their electric and their acoustic guitars. However, amplifiers designed for the electric guitar are designed entirely differently. For the best sound, you will likely need separate amps. Those amps are designed to take the bulk of the electric tones and use a beefed-up system to handle overdrives and huge wattage to deliver that rock sound. Because so much is invested in durability, a lot of the tonal ranges are lost and muddled together. For most rock, metal, and jazz, that is just fine. For acoustic playing? Not so much. You see, amps for electric instruments have a limited frequency response. They also are designed more for distortion and to add “color” to your playing. Acoustics, however, need a wider frequency response and dynamic range to embrace all of those subtle tones. And distortion/color is exactly what you typically don’t want. High-quality Acoustic amps are designed with one focus: amplifying the true sound of your guitar. There is a lot more effort invested in designing speaker systems with carefully calculated ranges that keep the tones from overlapping each other and muddying the quality of sound. If you tried playing your electric guitar through one of these systems, you’d probably blow it out, but the warmth and quality of the tone produced are unmatched. Let’s face it, as much as we all love the sweet, unadulterated sounds of an unplugged acoustic, there are times when you need more “juice”. I’ve heard performers completely drowned out by the noise of conversation during the busiest evenings at our local coffee shop. Not that anybody in a coffee shop wants to be overwhelmed with “Smelly Cat” being belted across the building, but you want to be heard in a clear and warm tone, even during busy times. So what size amplifier do you need? For playing around the house, you really don’t need much power — if any. 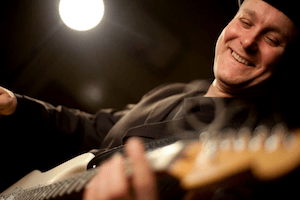 Most people who practice with an amp at home are mostly looking to become comfortable with the amplified sound before they take their music to a more public place. Anything in the sub-30 watt range should be fine. I had a 15-watt that I really liked when I was getting started. 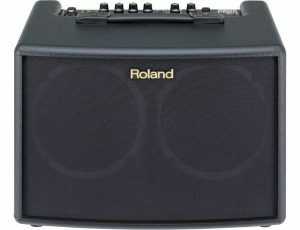 For the small-time gig at your local coffee shop, an amplifier in the sub-70 watt range should be fine. Just enough juice to get your sound out there, without breaking the pocketbook. (Let’s face it, it takes awhile for those tips to add up to pay off the new amp). Finally, if you are adding a band and drum kit to the mix, you really need to kick the power up. I’ve seen people say that 100 watts are enough, and I guess, for the smallest venues it might be, but if you can afford it, you might want to go a little bit bigger or check out one of our amplifier/speaker combos that let you upgrade as you go along. For example, if you want to run an entirely separate “voice”, having the second speaker and channel can let you switch easily between speaker presets with a foot pedal. In addition, you can use the dual channel setup (dual inputs) to run a second instrument or to amplify your voice through the same setup. This is a never-ending debate. The upside with tube amplifiers is that they produce a lot warmer and more mellow sound. They also can deliver more of the tone without clipping the sound. Because of this, a tube amp with less wattage will be significantly louder than a solid state with more wattage. Part of the fun of playing with an amplifier is being able to take advantage of different sound effects that are built into the amp. Solid state amplifiers tend to have more effects built into them than tube amplifiers do. Just be aware that effects are one way to easily increase the marketing appeal of an amplifier. Just because one amp has 200 effects does not mean that it is better than the one with 10 effects.